Finally the video from the launch campaign 6 months ago have been released on YouTube. We do never get tired of watching it so check it out! After the successful launch and recovery of the SQUID experiment there is still a huge amount of things to do. The experiment recorded a lot of data from the different sensors (gyros, accelerometers, magnetometers etc.) and now we have to analyze the data in order to understand how the system behaved. One of the interesting sensors onboard the FFU were the gyros, that give the angular rate on the three axis. During the deployment of the wire booms, due to the increase of the moment of inertia of the FFU, the spin rate (or angular rate along the z axis) would decrease, so by looking at the recorded data from the gyros we could have a good idea of how the wire booms have behaved, which is specially important as the FFU was lost from the field of view of the camera very soon. From the gyro data (see figure) one can clearly see the slow down of the spin rate just after ejection along the z axis, while the angular rate along the x and y axis is very close to zero, meaning that the ejection was almost perfect. What one can see on the slow down period is that there is a sudden change of the slope of the spin rate curve. By comparing this curve to a dynamical model of the system we could see that the reason for this seems to be that one of the wire booms failed after deploying around 30 cm. This was of course not good, but it didnt have a big impact on the overall performance of the FFU as it keept on spinning stably. At the end of the slow down sequence one can see that the curve becomes flat, which means that the other three of the spheres stopped deploying (as it was expected) and the FFU kept on spinning with the wire booms deployed. After this, the retraction sequence starts, and again one can see a slight slope change of the curve, which means that a second SCALE system failed during retraction. The objective of retracting the wire booms was only for preventing them to entangle with the parachute, but luckily this did not happen and therefore it was not a major failure on the system. One can also see another interesting event on the plot. At the end of the retraction phase, the spin rate of the FFU should be very similar to the initial one, but as one can see this did not happen, as it seems that the spin rate is decreasing (as expected due to the decrease of the moment of inertia of the FFU), but then suddenly it starts spinning up again, and becomes unstable (one can see that the data from the gyros on the x and y axis starts becoming messy). It seems that this was because the FFU started “feeling” the atmosphere before expected. 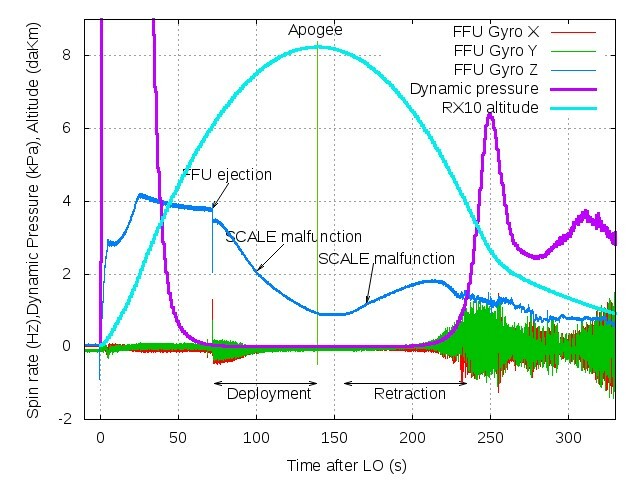 One of the curves is the dynamic pressure, which was derived from the data recorded by the Rexus service module, and as one can see, at the moment on which the FFU becomes unstable, the dynamic pressure starts increasing, meaning that aerodynamic effects start being noticeable. There is still a huge amount of data to analyze carefully, so this task will keep us busy the next months. We will keep you informed about our progress! I know that the blog during the last week have been very poorly updated and I´m deeply sorry for this. Some more detailed posts about the data processing are on their way but in the mean time I just wanted to tip you about the EXPLORE team´s video which they recorded during the launch of REXUS 9 which where launched the day before our rocket. The video is recorded from a camera which where mounted on the side of the payload so they have managed to capture some great shots of the launch. Due to copyright issues on the music the above clip may not be available everywhere so for those of you who can´t see it there is another clip without music. As the case is for the end of most hectic periods in life one of course needs to end them by a great party. During a launch campaign this is done at the campaign party. Originally the idea was that is should have taken place during thursday night but since REXUS10 was successfully launched already by wednesday this plan was changed because as Olle said “everyone will celebrate during Wednesday night anyhow so we can just as well have the party by then as well”. The deal for the party was that Esrange would arrange food and beverage while the teams had to arrange the entertainment. Our idea was to arrange a bloopers video which David edited during the last hours before the party with some help from the rest of the team. At seven o clock all teams gathered outside the canteen where Olle explained the idea for the night which was that we would use standing tables in order to get more circulation in between the different teams. Thereafter we all went in to the canteen to get some food, the Esrange cooks had prepared a great meal based on beef which had been grilled on the outside in the cold during the afternoon. The food was in deed great! During the dinner the entertainment started. The contributions from the different teams were of great variation. The Explore team had for example made a great video which had been recorded by their camera on the side of the REXUS9 rocket, while Sponge had arranged a art display where different people characterized known art pieces, Telescobe had written a great song about the failing door of their experiment. During the night Olle also handed out two prices to the teams. The prices were for the friendliest team and for the most technical advanced / scientific experiment and the winners had been decided by voting among all teams. The price for the friendliest team went to Telescobe with their great Irish spirit. When the second price was given Olle said that he had never seen such a clear majority in the voting and asked if the audience could guess who the winner was. I was much surprised by hearing how the whole audience at once shouted SQUID SQUID SQUID SQUID! We could not have been more proud then we were then! The last event of the official part of the night was to hand out diplomas to all participants this was conducted by captain Australia who came flying in to the canteen in is shiny blue suit. What happened after the official part of the night will stay among the teams but I can tell you this, the night was not over by far and I´m quite sure that everyone had quite an hangover the day after, at least so did I. After two amazing weeks the time have come to leave Esrange. 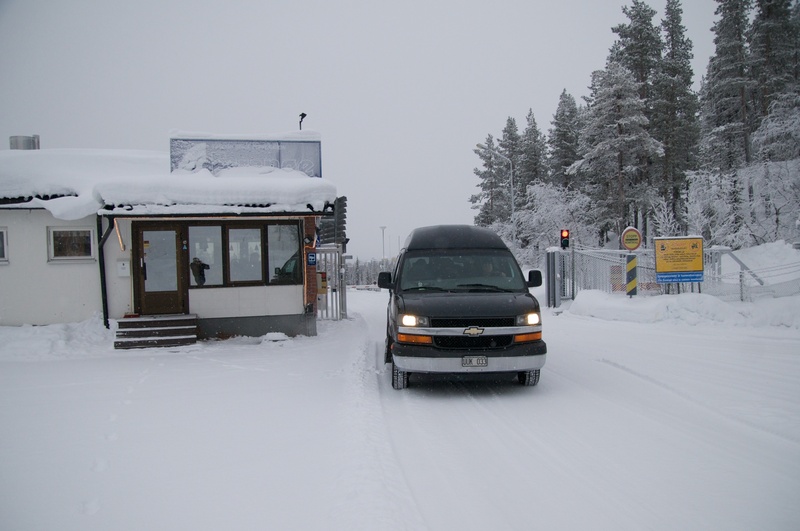 The team is currently in the car and we left Esrange for about two hours ago. Even if this marks the end of the launch campaign this does not mean that the project is finished. We will have plenty of work to do in order to evaluate the results of the project. This will end up in a number of documents. We also hope to be able to go to the 20th ESA Symposium on European Rocket and Balloon Programmes and Related Research. Which will take place in Hyéres, France, between the 22nd and 26th of may. The final report of the project will be the last version of the SED which will be handed in at the end of June. Under this period we will try our best to keep the blog updated! After the successful launch of Rexus 10 we still have a lot of things to do. There is a lot of data stored on the FFU which will have to be analyzed in order to fully understand how the system has behaved and recover the scientific data gathered by the experiment. This data is stored in the memory inside the e-box and has not yet been extracted as the FFU was wet after landing in the snow, and as water and electronics dont like each other we decided to leave it drying. But probably you have already seen the video we posted yesterday. The images are impressive, but the main objective of mounting the camera was to film the FFU in order to be able to check how the spheres were deployed. Unfortunately the experiment module was coning (it had a quite high precession angle) and the FFU was lost from the field of view of the camera after a few seconds. However, if one analyzes the movie carefully can extract some useful information. On the pictures you can see some snapshots taken from the camera shortly after ejection, when the FFU was still in the field of view. Of one checks the pictures from 2 to 7 can see the doors of the SCALE systems popping out gradually (all four of them) which means that the SCALE systems were in fact working, as the doors can only be released if the motor of the wire boom systems are working. The FFU also appears later on in the video. It was however very far from the experiment module and details can hardly be identified. One can see it in the last pictures, on the bottom half of the photos close to the edge of the ejection spring (dont get confused by the brilliant thing appearing on the top of the photos, which is the nose cone of the rocket). We were unlucky enough to have the sun very close to the area on which the FFU was flying, so on the photos it usually appears as a shiny thing close to the spring. There is however a very interesting photo. If one checks the very last picture, one can see the FFU body very close to the edge of the spring and what seems to be two of the spheres close to it. We do know that at least two of the spheres were deployed, as when we recovered the FFU two of the cables had been damaged during reentry, probably because the motors driving the wire boom systems could not overcome the centrifugal force during retraction and stalled, leaving the spheres on the free airstream, which ripped them off the cable. We will not know surely how they worked until we really process the data, specially from the sensor wheels on the SCALE systems and of the gyros and accelerometers of the FFU, but so far so good.